After manually setting time and date many times, my Computer which runs in Windows 7 never shows the actual time. How to fix the correct time zone? 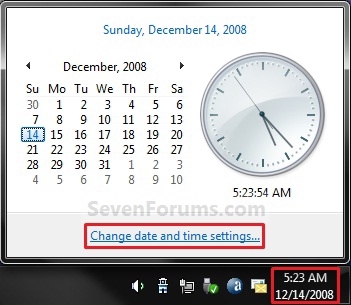 If your PC is automatically changing itself to the default Time Setting set by the Company, then it means that the Battery inserted in your laptop or PC is too low or too old. You must replace that CMOS battery immediately. In Desktop, CMOS Battery is fixed in the motherboard, circular in shape, usually in the shape of a coin and slightly thicker. 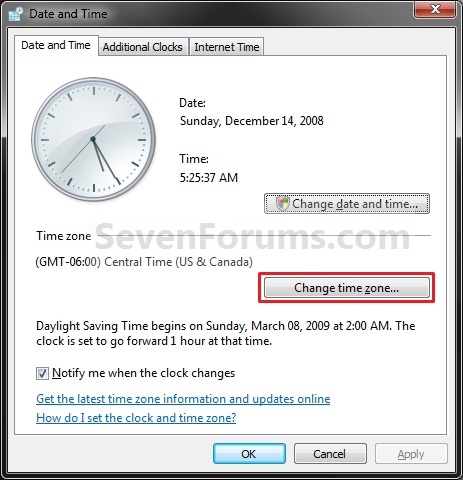 There are many reason to Time Zones show the incorrect follow these step to set the time zone.. Right click the time then set the date and time then restart a computer if the date and time show the incorrectly that means you computer other problem. it may be motherboard battery became a week so you replace the battery and put a new battery then open the computer and press F2 button you go to bios setting. here you set the date time then start the computer..
you find your problem short out.. NOTE: If you would like to be notified with a notification balloon when the clock changes, then check the Notify me when the clock changes box. 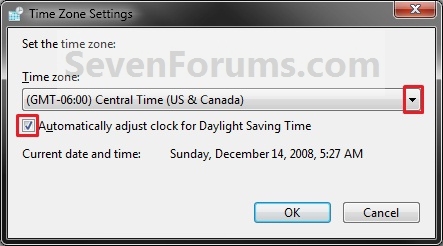 NOTE: It is recommended to have this check to keep you system clock accurate for Daylight Saving Time.